Alkaline-based, concentrated cleaner with combined action to clean oily dirt and remove organic and inorganic residues. 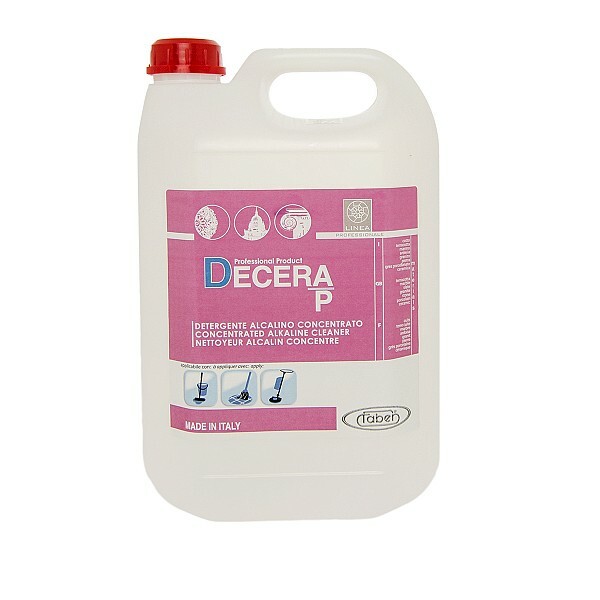 DECERA/P is an alkaline-based concentrated cleaner with an effective action on oily dirt, even if long standing and built up over time, as well as residues and stains of an organic nature, such as oil or grease, organic polymers such as silicones, wax, resin and surface treatments in general. DECERA/P is a versatile, effective solution for cleaning floors with a variety of accumulated, long-standing dirt, such as from foot traffic, as well as organic and inorganic residues, and residues from metal working. DECERA/P is quick and easy to use, meaning it is suitable for large areas, such as industrial flooring, professional kitchens, workshops and mechanical industries, etc. The product is also the ideal solution to remove inorganic residues, such as cement-based fillers or sealants, from all those surfaces that would not withstand an intervention using an acid-based product, such as marble and other natural limestone-based products. DECERA/P is also effective on surface film caused by incorrect floor maintenance. DECERA/P is a product that as well as being suitable for use on its own, is often used together with DEC 21 solvent-based wax remover for a full, deep wax removing action, known as “double wax stripping” Double wax stripping is an operation developed especially to remove any organic compound or residue from a surface, such as, wax, resin or previous treatments, or even layers or stains of oily dirt.